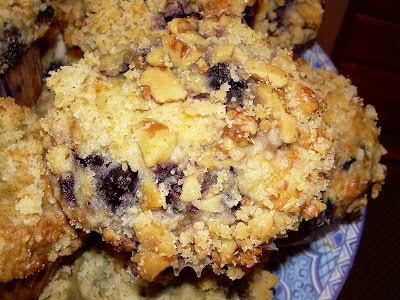 TWD, Part 1 – Blueberry Crumb Cake. Banana Cream Pie to Come! I’ve been traveling, got a headcold, and have been busy with LIFE – you know, the stuff that happens that interferes with baking, cooking, and blogging. Later today I will post the Banana Cream Pie that the TWD bakers made this week, but I wanted to go back and post the Blueberry Crumb Cake of a couple weeks ago, since I didn’t get a chance to make it then. I really wanted to make this because coffee cake/crumb cakes are usually easy, pack a big flavor punch, and are well received by my Honorable Husband, Master Chow. 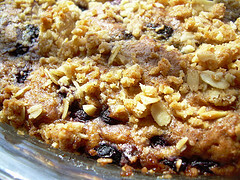 Sihan of Befuddlement chose Dorie’s Blueberry Crumb Cake for TWD a couple weeks ago, and you can find the recipe on her blog, or finally go out and get Dorie’s wonderful book, Baking: From My Home to Yours. As far as the cake went, I made the whole thing in my food processor. 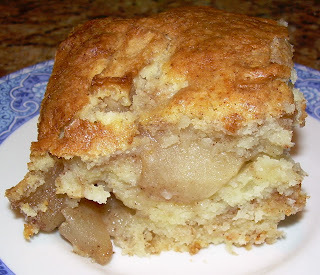 The one thing you have to be careful about is mixing in the flour – you barely want to pulse it in or you will over mix the batter and get a tough cake. I increased the lemon zest to that of a whole lemon, and instead of the crumb topping, I substituted an oat topping that I prefer. Why? The topping on crumb buns always looks amazing, but I find that they generally have no flavor – they’re just sweet. I really liked the depth of flavor that the oats provided on this crumb cake, and so did Master Chow – he asked me to put it on the repeat list! Be sure to stop by later today for the Banana Cream Pie post. In the meantime, check out the TWD blogroll to see what others have been up to! Like many of you, two of the reasons I started this blog were to give me the incentive to use my many cookbooks, and to document what I do. The good news: it’s working! 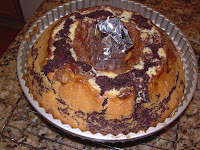 The bad news: I’ve had to increase my cardio workouts at the gym.One of the items that I decided to bake is a Sour Cream Black and White Coffee Cake from Carol Walter’s fabulous new book , Great Coffee Cakes, Sticky Buns, Muffins & More: 200 Anytime Treats and Special Sweets for Morning to Midnight. This is quickly becoming one of the favorite cookbooks in my embarrassingly large collection. 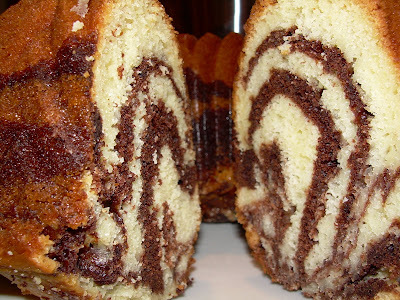 I’m not going to write out the recipe – the directions to get the swirl pattern are quite lengthy, and I’d rather spend my time cooking! 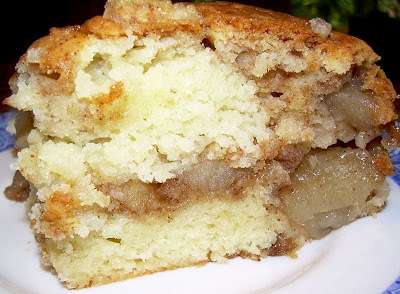 When I notified Master Chow that I had just just baked the aforementioned coffee cake, a look of mixed joy and horror crossed his face: he loves coffee cake, but he squeaked: “What! Before my reunion? !” You see, he has a Major Reunion coming up this June, he’s looking fit, and he doesn’t want to blow up into a blimp before then. “Master Chow,” I said patiently, “it’s February. You don’t really expect me to stop baking for the next five months, do you?” He promptly realized the futility of any such argument. He and I tasted a little piece, and he took the rest to work. A happy compromise! I learned a couple things from this recipe: do not substitute low fat ingredients, even it that’s all you have on hand. The recipe calls for bittersweet chocolate, but I highly recommend you use semisweet – the cake is not overly sweet, and really benefits from a slightly sweeter chocolate. Now, you ask, how did I discover that? Why, I burned my first batch of chocolate, that’s how! I tasted a wee part that hadn’t turned into charcoal, and promptly realized that I need to use a sweeter chocolate, so I did. But that’s another story. For those of you who have never burned chocolate, and might be tempted to use it anyway – don’t. I learned that many years ago, the hard, nasty-tasting way. Ugh. 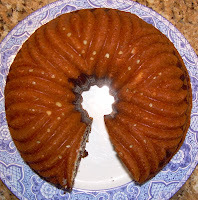 Now, the interesting thing is that, even though I loved the taste of the cake, it was a bit drier than I would have liked, because I used low fat sour cream (all I had on hand). As it sat out in my husband’s office, he said it became even drier. And you know what? Folks told him that it was the best or one of the best coffee cakes that they had ever had! They also said that the chocolate was “really good,” so use a good one if you decide to make something like this – it makes a difference. All this made me realize, once again, how little most people cook, and that their access to baked goods is usually limited to Aisle 4 in the grocery store. Good eggs, fresh butter, and premium chocolate make a difference. I recently heard that Julia Child once said that “people have forgotten what food is supposed to taste like.” So true. And that’s one of the reasons I cook so much – I love the idea of keeping a tradition of “real food” alive, even if a cake comes out a little drier than expected. Update: there was a typo in the recipe – it called for 11 1/2 teaspoons (!) of baking powder, when it should be 1 1/2 teaspoons! What do you do when weather predictions don’t pan out? You bake! Master Chow and I were supposed to attend a local reunion of graduates from his Hawai’i high school. Weather reports said to expect some freezing rain, but they were just a teensy bit off. We are now looking at a snow storm that is expected to drop up to eight inches, followed by freezing rain. Needless to say, we are not going anywhere. So, I decided to bake a coffee cake and roast a chicken (more on the chicken in a later post). 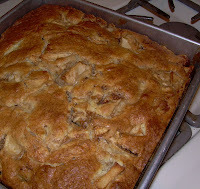 I was reading Nic’s blog, Baking Sheet, and came across a coffee cake recipe. I, too, had a container of sour cream that needed to be used up. Yes, that was my excuse to bake. Last year was very busy for me, and I did not bake nearly as much as I wanted to, something that I hope to remedy this year. So, I pulled out my baking pan and mixer, and got to work. I left the nuts out of the batter, and just added them to the streusel topping. I used candied walnuts that I made myself, and will post the recipe soon. This cake’s primary flavor is . . . butter. Mmmmm. Master Chow asked me to put this on the repeat list, and observed that the candied walnuts added a lot to the cake. I, myself, would like a bit more vanilla flavor, so next time I will increase the amount called for. A quick and easy recipe for a snowy day. Master Chow ate three pieces. In his defense, he works out religiously and only indulges in treats one day per week! Preheat oven to 350F and lightly grease a 9-in square pan. In a medium bowl, stir together all topping ingredients until wet crumbs are formed. Set aside. In a large bowl, cream together sugar and butter until light. Beat in vanilla, followed by the eggs, adding them one at a time until mixture is smooth. In a medium bowl, whisk together flour, baking powder, baking soda and salt. Add to sugar mixture, alternating with sour cream in two or three additions, until well mixed. Stir in nuts and scrape into prepared pan. Batter will be thick, so you will have to spread it out evenly with a spatula. 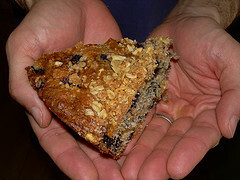 Top with streusel mixture, spreading it into as even a layer as possible. Bake for 35-45 minutes or until toothpick inserted into the center comes out clean. Cool on a wire rack for at least 30 minutes before slicing. Serves 9-12, depending on how big the slices are.